Marilyn SanClemente February 2, 2015 February 2, 2015 Occasions catalog, Spring, Stampin' Up! I’m so excited today! I was asked by my good friend Angela over at Angela’s Ink Link to be a part of this Creative Blog Hop. It’s a one time post and we can post any project that we would like and then answer some questions below. I have always admired Angela’s work. She and I are two of the 5 members of the Stamping New England Design Team. Today’s project is one of the cards that I made for my recent Trip to Leadership in Orlando. We had soooo much fun – more of which I will share over the next few days! I roomed with Angela and another member of the Design Team Jeanne Nielsen and to say we had fun is an understatement! It was so great to escape cold and snowy New England for a few days in Orlando! Anyway – on to my card…. I absolutely love the new Butterfly Thinlits dies that are in the Occasions catalog for the spring. So I wanted to do something with these thinlits. The colors for this card are Crisp Cantaloupe and Calypso Coral. The designer paper on the card is Gold Soiree Designer Paper from the Big Book. I used it behind the Butterfly and again with a small strip at the bottom of the card. Card base is a piece of Whisper White cut to 4 1/4″ x 11, scored at 5 1/2″. The top layer is a piece of Crisp Cantaloupe cardstock. I used my Big shot to cut the medium Butterfly from the cantaloupe layer. Next I used the Delicate Designs Embossing folder and the Large scallops d ie to add the little detail at the bottom of the card. The flowered paper at the bottom is a 1″ piece of Gold Soiree DSP. There is also a 4″ x 3″ piece of designer paper behind the butterfly. You will probably notice that the butterfly on this card is actually a little darker. I wanted the color difference between the card front and the butterfly so the butterfly pops off the card! 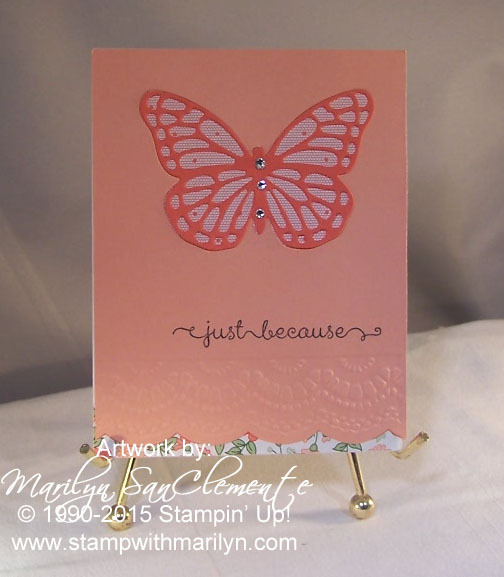 So this butterfly is Calypso Coral which coordinates nicely with these colors and the designer paper. The greeting is stamped with the A Dozen Thoughts stamp set. And of course, no card is complete without a little bling. So I added a few Rhinestone jewels to the center of the butterfly. That’s it for this card. I will add my other two cards that I used for swaps later this week. Right now I am working on creating a really cool 3D Valentine’s card for a class that I am holding tomorrow night at my church. Stay tuned for a picture and details of that card. I am also working on documenting my cards for my February Design group; Stamping New England. Check out more information on our Design Team here. My style – how to describe it? My downline Margaret describes my style as very traditional. I love using Stampin’ Up!’s Designer papers and the way all the colors coordinate with the inks and cardstocks. It makes designing projects so much easier. I love clean lines and layering with some embellishments and bling. Not over the top with embellishments, but embellishments that enhance the project. I love crafting and have always been a crafter, even as a kid. I started papercrafting in the scrapbooking domain. After my daughter – now 20 was born, I would come home at night after a stressful day at work and scrap all of my pictures. When I decided to stay home with my kids a couple of years later, my friend took me to a Stampin’ Up! party and introduced me to the larger world of paper crafting. That was it! I found my passion. I use everyday things around me for inspiration on color combinations or layouts. My favorite design tool is a sketch. I select a given Designer paper and then pull out the coordinating colors for that paper. Then I work off the sketch, looking for an image that is similar in size to the key element on the sketch. So if I hit a mental block – I will pull out a sketch and some designer paper to get back my creative mojo. Thanks so much for stopping by today, and be sure to visit my Stamping Friend Toni Tessler at Toni’s Adventure in Stamping next week on February 9th!